Australia’s leading eco store, Biome, has expanded its range of cruelty-free beauty products with the launch of its palm oil free Light Face Cream. Enriched with nourishing plant oils and shea butter, the light face cream formulation features nourishing and beneficial ingredients including aloe vera, hemp seed oil and jojoba oil. Founder of Biome, Tracey Bailey, said Biome’s Light Face Cream was created especially for conscious consumers. “The nourishing moisturiser contains 100 per cent natural and organic ingredients, and is palm oil free and vegan making it suitable for consumers conscious of animal cruelty and the environmental issues associated with palm oil,” she said. Biome’s Light Face Cream is available in scented and unscented options with the scented formulation containing an essential oil fragrance of Orange, Ylang Ylang, Cardamom and Jasmine, reminiscent of Morocco. The natural formulation is non-greasy and fast absorbing making it suitable to wear under makeup, and the product is housed in a zero waste reusable and recyclable glass bottle. Already making waves in the beauty industry, Biome’s scented Light Face Cream has been selected as a finalist for the Pure Beauty Global Awards 2019 – shortlisted from 500 entries globally. 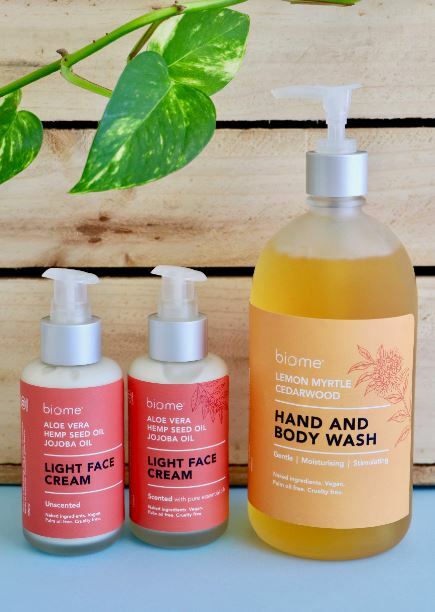 Biome is dedicated to protecting the environment via an ethical and innovative retail business model that empowers customers to make a difference to the wellbeing of themselves and the planet through education, and by providing an extensive range of thoroughly-evaluated environmentally and socially-responsible products. The business was founded in 2003 by Tracey Bailey and now employs 60 people across its online store and Brisbane stores located in Paddington, Balmoral, Indooroopilly and Brisbane City.